Over on a month of Smiley Silliness it’s Inspire Your Heart With Art. My heart is often inspired by beauty. I am grateful for art, be it in nature or by the hand of an artist. I love this quote about seeing beauty with one’s heart: Here is my secret. It is very simple: It is only with the heart that one can see rightly; what is essential is invisible to the eye (From my favorite book The Little Prince by Antoine de Saint Exupéry). It’s also Eat Brussels Sprouts Day. As a person who has always loved brussels sprouts I am so happy they have come into vogue recently. You can find brussels sprouts on menus everywhere! Well, not at fast food joints, but as long as we’re Inspiring Our Hearts with Art, how about keeping your heart healthy. 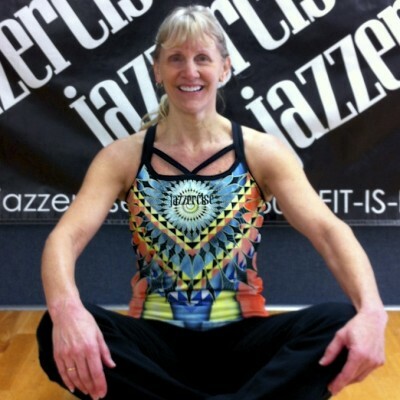 How about exercising like my pal Ann the Jazzercise instructor in today’s Smiley picture (the eyes are the cutouts at the top of her shirt). Today we say happy birthday to Jackie Robinson (1919). I recently read a novel about a young boy who proudly wore his “I’m with Jackie” pin to show Jackie support during his first season as the first African American to play in Major League baseball. How lovely. Jackie surely inspired hearts! Birthday wishes go out to Justin Timberlake (1981). He’s certainly surprised us. His post ‘Nsync career has been filled with delightful, clever performances. This is not often the case for teen band members. And a Smiley birthday to Ellen DeGenres‘ wife Portia de Rossi (1973). Just FYI, I was in high school when she was born. Way to make a gal feel old! Did you ever notice they both have last names starting with DE? Kind of freaky. Kind of cool. Over on our calendar of a Month of Smiley Silliness there are lots of additional Smileys and wacky holidays. I hope you’ll take a look.